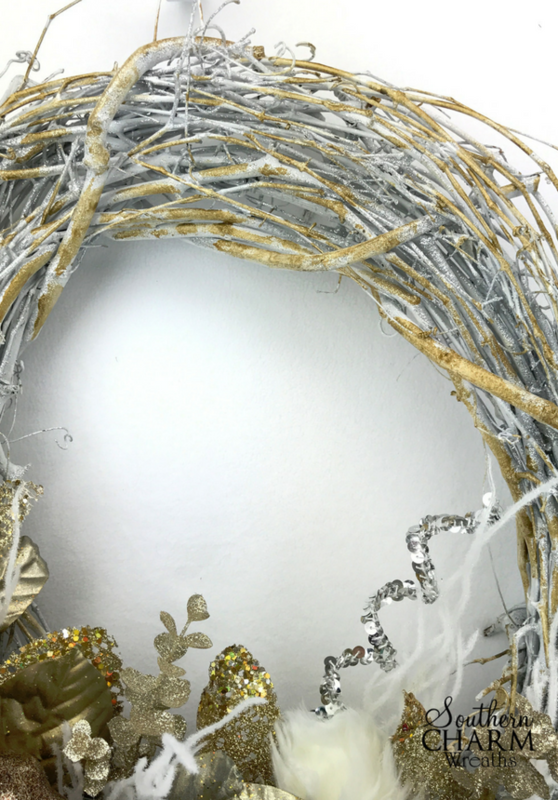 Today in the wreath shop, I’m showing you how to make a super quick and easy New Year’s Door Wreath. Ever wonder what to hang on your door for New Year’s? Well, this wreath will do just the trick. Plus it’s generic enough that it will last you through the winter months as well. This post contains some affiliate links for your convenience. Click here to read my full disclosure policy. 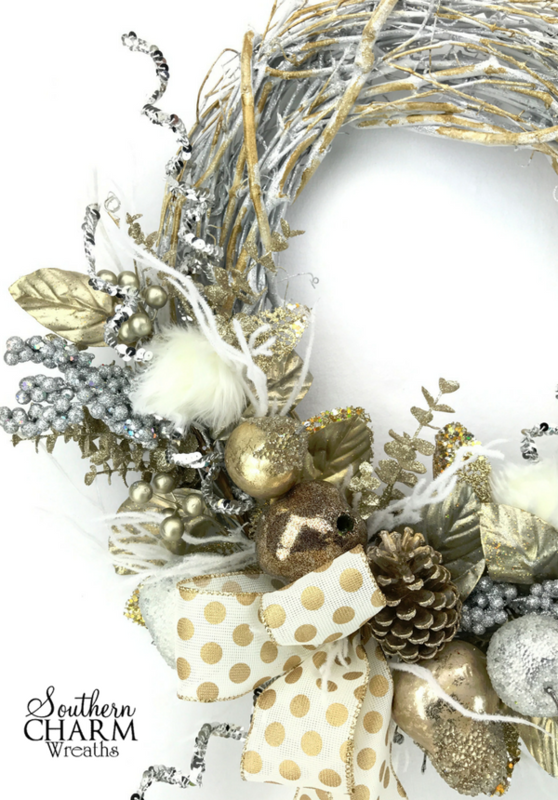 Use a sponge brush and add some metallic gold paint here and there on the wreath. 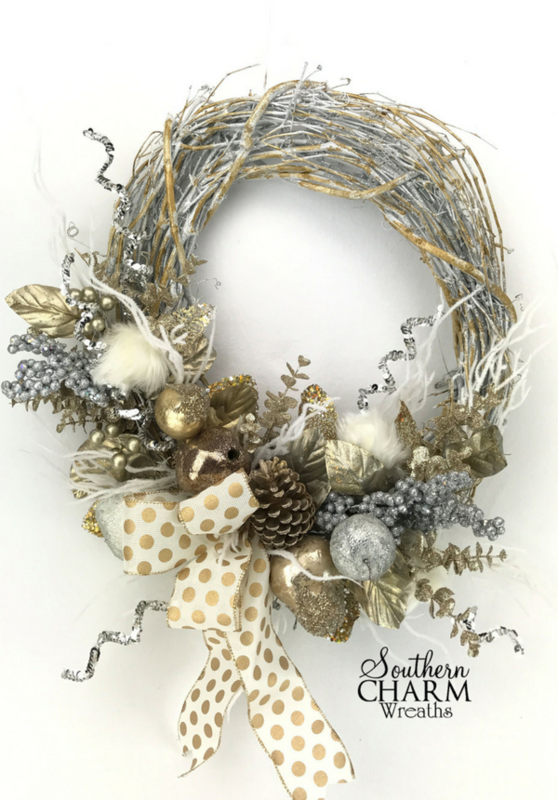 No need to be precise with the paint, you just want the gold to take some of the starkness away from the white wreath and blend with the premade floral swag. If you can’t find a white painted wreath to start with, paint your own using white spray paint. Zip tie the premade swag to the wreath in three places; once in the center and then on both ends. 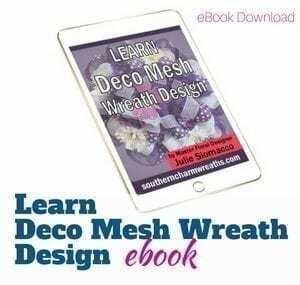 You want the wreath to be sturdy on your door since it will be opened and closes often. 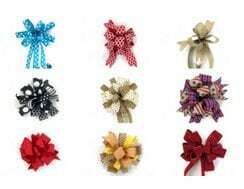 Make a bow using 2.5″ wired ribbon. I made three loops each measuring 10″ long. Refer to the video below for exact instructions on how I made mine. Use floral picks and hot glue them in between the fruit and leaves on the swag. Also add some to the top and bottom and don’t forget to add some under the bow. Make sure to cut the floral picks into pieces. Hot glue any ornaments you want to add. 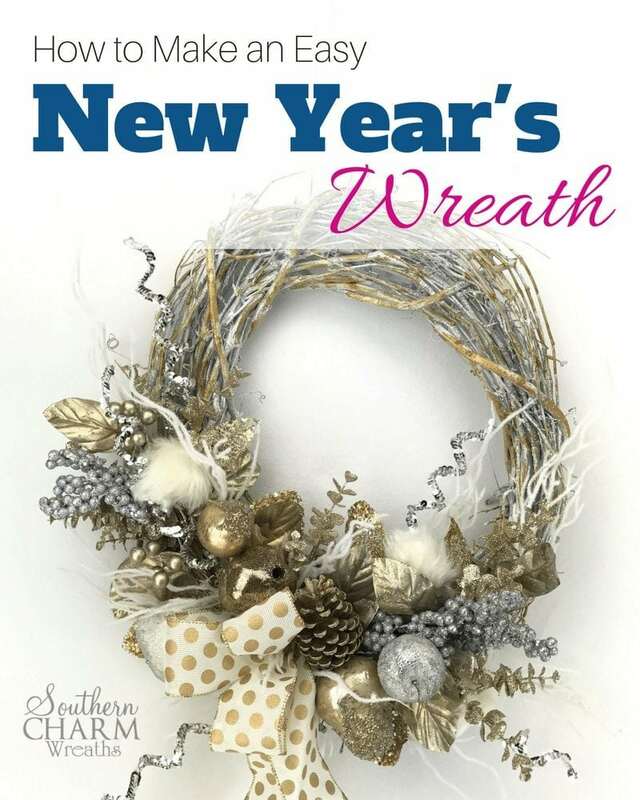 If you have a New Year’s Sign, you could add that to the top or leave empty like I did for a more generic wreath that will also work well in the winter months. There you have it a beautiful and easy to make New Year’s Door Wreath. I hope you enjoyed this New Year’s Door Wreath tutorial. How do you decorate your door for New Year’s? 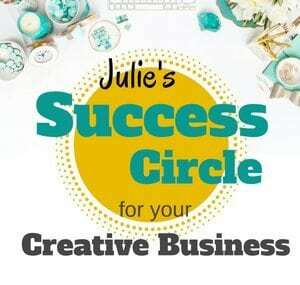 Let me know if you enjoyed this and don’t forget to join me on Facebook Live, Thursdays 7:30PM EST. 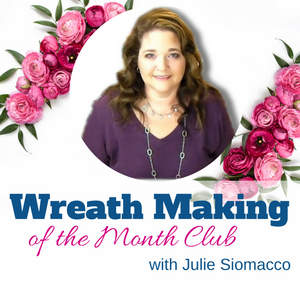 If you would like to join my wreath making of the month club, join here. Beautiful wreath! I love these quick wreaths! Thank you for sharing. 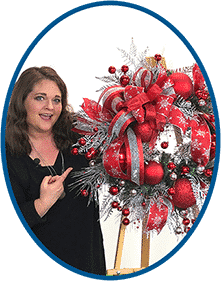 I am in your wreath of the month club. You are so inspirational, love watching you working on your wreaths, and give from your soul.